"Mirror , Mirror on the Wall ... Little Black Dress .. I will soon be slipping into thee with ease"
As January is coming to an end , let's give the diet a final boost . Here is another delicious and enticing everyday recipe. Based on the classic "Ratatouille ", a dish that can be made quickly and economically , using readily available fresh vegetables and served with an oven roasted breast of chicken, very low in fat . This is by all means a " Back to Basics ". What with today's quest for innovation and new taste sensations, it's easy to forget just how delicious ,fulfilling and above all healthy a classic recipe can be . 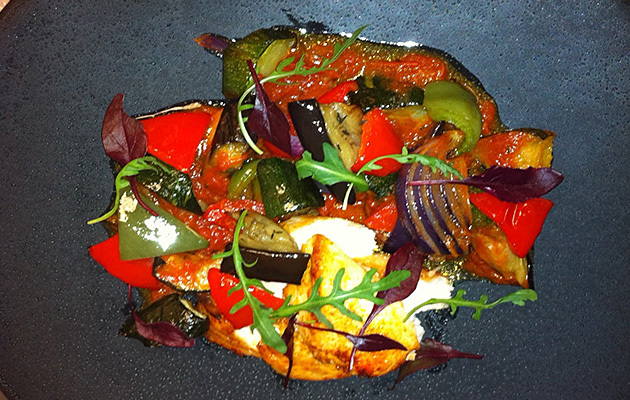 The Ratatouille can be prepared at short notice or well in advance and can be served as an accompaniment or as a complete well balanced meal . Use what you need and freeze the rest . The choice is yours . Preheat Oven to 180 0c . Prepare the vegetables and cut into large dice or in any shapes you wish. Place in a large bowl and coat with 1 tbsp of olive oil and the chopped rosemary . Place onto a tray , lined with with parchement along with the Chicken breast and bake in the oven for 25 mins . In the mean time, heat up the remaining olive oil in a pan and sautee the finely chopped garlic for 1 -2 mins on medium heat . Do not let it burn . Add in the tomatoe puree and cook for a further minute . Now add the chopped tomatoes , bay leaves and the chilli . Season to taste and simmer on low heat until reduced until thick . To serve, remove Chicken from oven and set aside to rest for 5 - 10 mins. This will allow the juices to flow back into the flesh and keep it moist . Warm up your plates . Remove the chilli from the tomatoe sauce and discard, Toss the roasted vegetables into the sauce and check your seasoning . Slice the Chicken breast at an angle into thick slices, and spoon the ratatouille around. Garnish with your herbs of choice .
" Now thank God for the hands that made it , A big Slurp of el Vino et Bon Appetit "